And he is so happy. 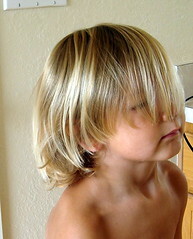 His request was to have his hair short enough that Aunt Kathy could see his eyebrows. Sounds like someone has been putting a little bug in his ear, my dear sister. 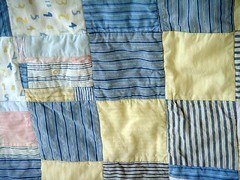 A quilt made from all Gap kids clothes. I can't get the colors right at all on these pictures... or the clarity ... sigh ... or maybe I'm just trying to hide all the flaws (there are so many). The fabrics are softer and more muted than they appear. This was a fun project for a Ditto Kiddo customer. She and I have always shared a love of Gap/Gymboree and have boys the same age, so a fun rapport has developed between us. 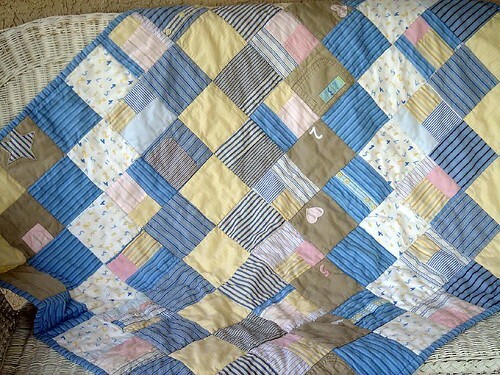 I ended up doing this quilt by default, she'd asked someone else and they didn't have time so they suggested that I do it. Very simple ... 5" squares, solid tan backing, stitched in the ditch. 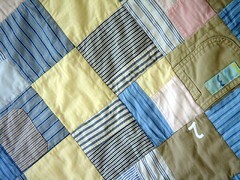 It measures about 40" by 50" ... large enough for a child to snuggle under it. 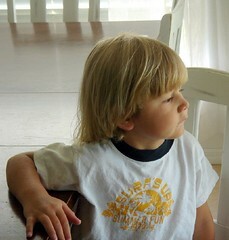 I let my older boy grow his hair until he was 2,5 Y old. They were looong too. And he has short - short hair since then. I`m bookmarking your blog for coming back here again! 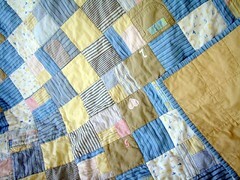 That quilt is To Die for!! I love the colors and soft look to it. Great job.